Today’s brands are no longer being measured against traditional competitors. They’re being measured against the very best companies in the world that are providing the types of experiences and services that consumers now demand from all brands, regardless of industry. That means that as a consumer goods company, your competition is no longer just the likes of Pepsi and Coke; you’re now competing against Apple and Amazon, too. To survive in the context of changing consumer behavior and pressure from digitally-native companies, there is a strong need for businesses to digitize their supply chains. Seeking efficiency and agility, consumer product manufacturers are working to create a completely integrated ecosystem that enables real-time product visibility from factory to consumer. Exploring this shift, including how companies are embracing digital and the challenges they face, EVRYTHNG conducted a Digital Supply Chain Benchmark poll among leading consumer product manufacturers at the Internet of Supply Chain Business Conference. Read more from Internet of Business. 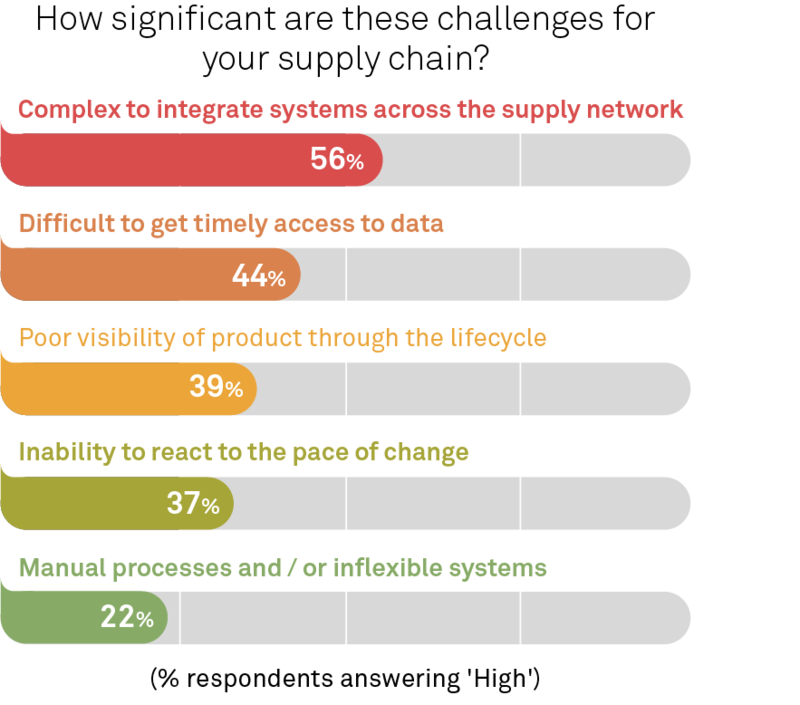 Of great importance, the biggest challenge companies currently face in their supply chains is integrating different systems across the network, which contributes to other big challenges: difficulty gaining timely access to data and poor visibility through the product lifecycle. 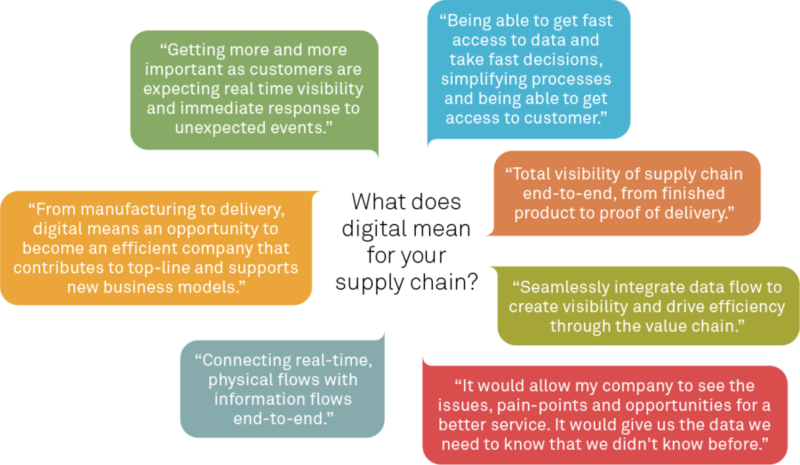 When asked what digital means for supply chains, the over-riding opportunity identified was visibility. Yet the poll also uncovered that the biggest area of weakness is real-time visibility. The poll results suggest that this real-time visibility is most useful for gaining valuable consumer insights, as respondents indicated that the most important benefit of a digital supply chain is the ability to get closer connections with their customers, ranking this higher than enabling new business models, driving new revenue and cost savings, which are often enabled once a business has established closer connections with its customers. This poll data also shows that we’re beginning to see goal congruency in organizations, with the supply chain sharing the desires of sales and marketing to connect with the consumer. 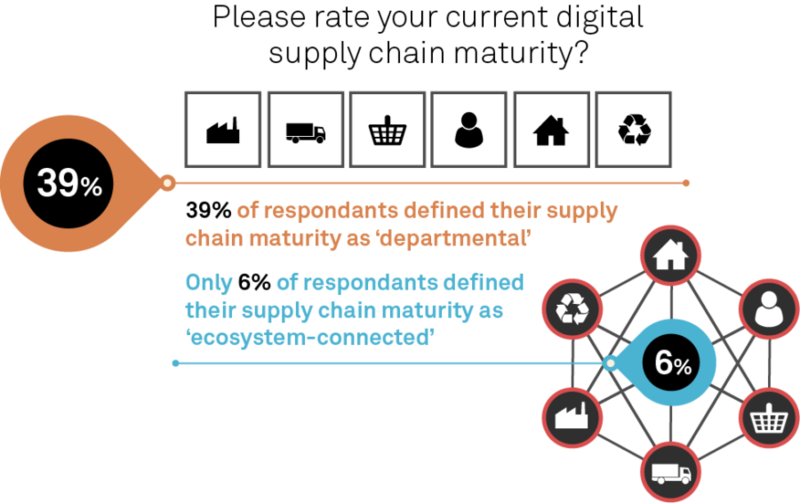 Rather unsurprisingly, 39 percent of those surveyed said their supply chain was departmental, pinpointing their progress at very beginning of the maturity spectrum. This emphasizes a reality that the complexity of the global supply chain is amplified by the fact that many organizations operate in silos, and the breaking of these silos are often impossible or undesirable. Because this fragmented supply chain limits the access to (and value from) data, the addition of an augmentation layer across the organization is an answer. As a whole, this benchmark poll indicates that although consumer goods companies understand the massive benefit of end-to-end visibility from manufacturer to consumer, they struggle with a lack of digital supply chain maturity and the complexity of legacy systems. These limitations often occur due to thinking that is point solution-oriented, departmental or vested in the capabilities of existing systems and landscapes. Historically, it has been very difficult to address this problem. But today, with the emergence of smart products, it can be cost-effective, while leveraging existing infrastructure. From shoes to jackets, from bottles of champagne to shaving foam, physical products can now exist in interconnected ecosystems, both physically and digitally, enabled by the web. Open web standards allow the interconnectivity of data, made accessible by the ubiquity of smartphones, granting access to data outside of IT systems and enterprise walls. We can create the “digital twin” of a physical product that lives in the cloud, where that digital identity can capture data that is then managed and shared throughout its lifecycle. When products are connected to the web, their movements, status and whereabouts can all be managed by digital systems. This means that products can generate vast amounts of data for consumer goods companies, while also creating a new, direct channel to end-consumers. These smart products can tell you where they are and where they’re headed. They can tell you what they are made of, where they were made and by whom. They can tell you what condition they’re in and where they were purchased. All of this data becomes visible to all parties involved, shared throughout the entire lifecycle of the product. Through the digital enablement of their products, consumer goods companies have a new opportunity to create a smart, connected supply chain, gaining the end-to-end visibility and real-time data that power greater efficiencies and stronger customer connections. Learn more about the value of smart, connected supply chains.